Full disclosure: today’s brunch wasn’t so much a proper brunch as me getting into town later than expected and ordering from the breakfast menu at one of my favorite cafes at noon. As such, mimosas were not in the picture. But I think it still counts. 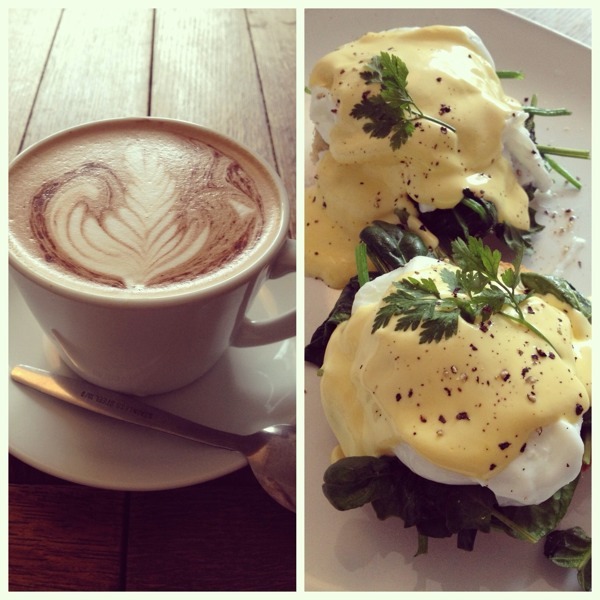 Look at that coffee art and those eggs florentine. You can’t tell me that’s not picture-perfect brunch food. Cafe Coho seems to be fantastic at most things they do, but I’m now especially partial to them as a breakfast or brunch spot. The eggs florentine I ordered, in addition to being beautifully presented, were heavenly. And as I mentioned before, the coffee here is excellent. Add all that to the fact that I’m eating and hanging out (and now blogging – free WiFi, y’all!) in a lovely upstairs room with some leather chairs and a little fireplace and it’s pretty much perfect. Granted, prices are a bit higher than other options in the area, but the food, coffee, and atmosphere certainly make it worth the couple extra quid. “Brunching at…” may become a regular feature of this blog. Because if this isn’t your favorite meal, I’m sorry, but you’re wrong. wow… that looks way to good to be eaten!